Her real name was Jane Trosserin. she studied singing at the Conservatoire National in Paris. already in 1924 she appeared at the Opéra de Monte-Carlo as Boy Yniold in ’’Pelléas et Mélisande’’ and as Javotte in ‘’Manon’’ of J. Massenet. Later she sang there parts of Manon (1932) and Olympia in ‘’Les contes d'Hoffmann’’. In 1934 she made her debut at the Grand Opéra in Paris as Gilda in ‘’Rigoletto’’ and then sang there the part of Queen of the night in ‘’Die Zauberflöte’’, Constance in ‘’Entführung aus dem Serail’’, Marguerite in ‘’Faust’’, the title role in 'Lakmé', Juliette in ‘’Roméo et Juliette’’ and had a special success in 1938 as Ophélie in ‘’Hamlet’’. 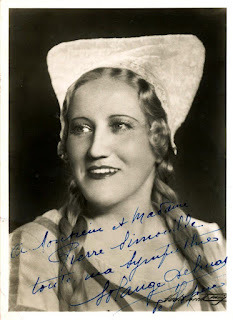 In 1937 she made her debut at the Opéra-Comique in Paris as Rosina in ‘’Il Barbieri di Siviglia’’ and appeared there also as Micaela in ‘’Carmen’’, Mireille and as Mimi in ‘’La Bohème’’. In 1953 she retired from the stage. Then she became a president of the Conservatoire in Nice.